Last time, I started to cut the pieces for the media console top and I had already built the box frame. 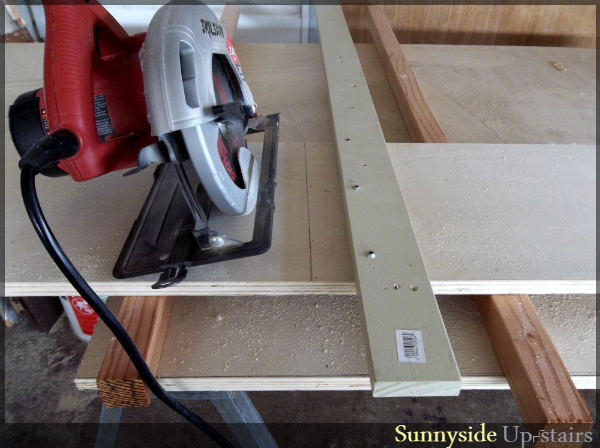 Next, I cut face frames out of 1x2s, as well as cut and attached doors and shelves made of 3/4" plywood. I paid $28.70 (with tax, rounded up to the nearest dollar) in new purchases. I used material sitting in our garage leftover from other projects, but the previous price I had paid for all materials so far is approximately $63.50. 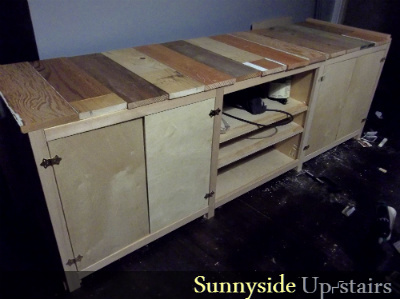 This media console has cost me $28.70 of my July budget, but would have cost me about $92.20, if you include the value of the leftover plywood from having my kitchen cabinets built last summer. I measured and drew lines on the plywood, used a 1x2 as a spacer, and screwed a board in to the side of the plywood, since my cut line was exactly the width of a 1x2 away from the edge. The board will act as my rip fence for guiding the circular saw in a straight line. For cuts in the middle, I lay the rip fence board on the plywood and propped up the piece to be cut using 2x2s, so as to allow only the 3/4" plywood I needed to be cut. I used surface mount hinges and folded up the packaging they came with to make spacers for attaching the doors. The media console after the first set of doors were installed. I cut the two center shelves out of 3/4" plywood using the circular saw technique described previously. I cut 1x2s to finish the front edge of the plywood. 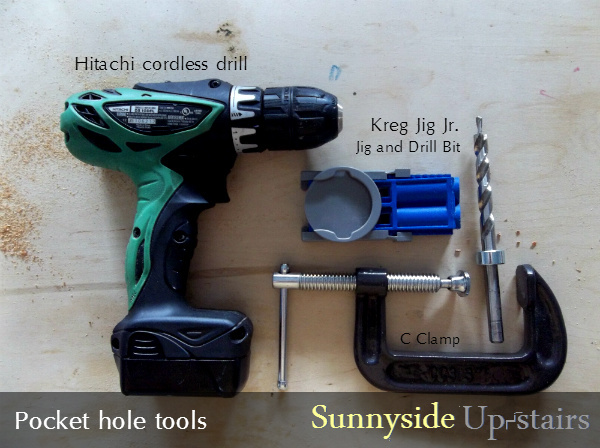 I set the Kreg Jig Jr. for pocket holes for 3/4" material, clamped, and drilled my holes in the front, and on the sides. I used Titebond III wood glue and coarse 1-1/4" pocket hole screws to attach the 1x2 front trim to the plywood using my Irwin clamp to keep everything together. 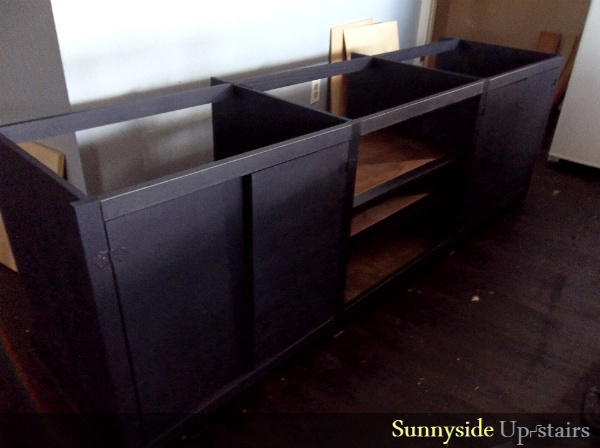 On the underside of the shelf, I used 3 pocket holes to attach the 1x2 and prepared 2 pocket holes on each side for attaching the shelves. 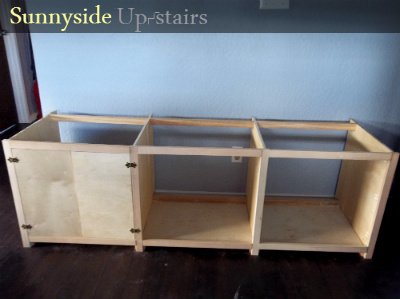 Using a yard stick, I measured the height of the opening below the shelf and used a carpenter square with a level to ensure everything was straight before screwing in the shelves to the walls of the console. For the fixed shelves, I made sure to cut the plywood so it would be a tight fit, which helped with keeping things in place while I adjusted them. 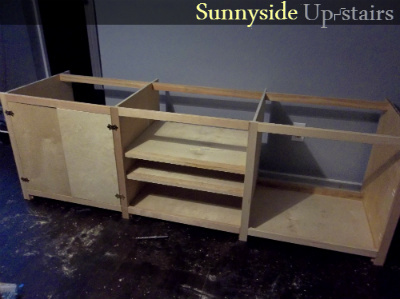 As the sun was setting, I had cut, assembled, and installed the two center fixed shelves and called it a day. 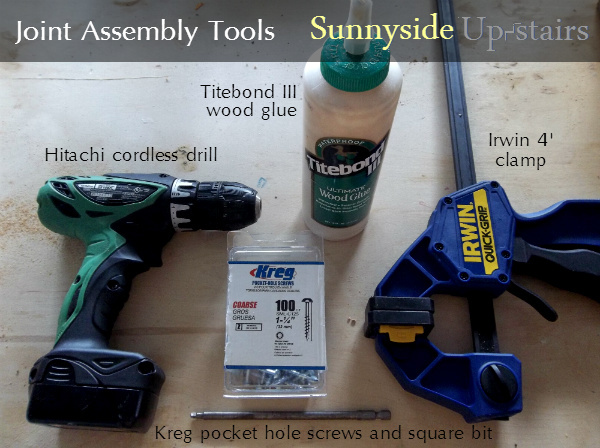 On the next day, I cut wood for the last shelf I would install and opened the Kreg Shelf Pin Jig I had just purchased from Amazon.com. I followed directions in the package, clamped the jig to my work piece, then used the shelf pin locator to mark where I left off. I then inserted the jig through the shelf pin locator, clamped it again, and continued drilling shelf pin holes until I had 10 in all. I placed the 4 included shelf pins into the fourth hole from the bottom and slid my last shelf right on top. It took considerably longer to do this, but now I can change the position of this shelf as needed. Once the last shelf was in, I attached the final two doors using the same method previously and placed my reclaimed wood top, well, on top. :) With just a little sanding, I was ready to paint. The console made me anxious at this point because it looked country chic, not sleek and eclectic, like I thought my husband would like it. It was his birthday present, after all. I painted the console in paint we already owned, flat Olympic Napoleon, a gray-black paint with a tinge of indigo in it. I love this particular shade of black and the matte look as well. My little helper woke up as I was painting the first coat, so I flipped the console so the bottom was exposed and let her help me paint. After we painted, I brought out some gray felt, cut it to fit the length and width of the "feet" and hot glued it to the bottom to prevent scratching our floor. My daughter found something to play with in her room, so I finished the bottom by rolling a thin coat of Napoleon and proceeded to finishing the rest of the piece. By Thursday, the console base was completely painted in Napoleon. All shelves were stained with Watco Danish Oil in Dark Walnut. I painted the hinges Napoleon as well, to lessen the country chic look it had earlier, which I hoped to pair better with my husband's tastes and the sleek electronics this console would house. In the period of 1 week, and after investing 26 hours, including paint time, I had successfully built a custom console table mostly from material we already had, using no plans, and just sort of reasoning my way through the experience. I was amazed that I went through this journey without second guessing myself this time and I am thankful that I didn't hit any major road blocks and was able to present this to my husband by the Fourth of July.